... Hanna Fluk's paintings take place in Jerusalem, at the peculiar intersection of religions, cultures and layers of times. Religion, religiousness is a default motif, however her pictures are not religious ones in the traditional sense. Art as a concept is inseparable from Humanism. A work of art, created in answer to a question (the specific question of the artist), in turn provokes other questions It is, in essence, an interrogative medium. This questioning relates to being, to codes, to law, and also to language. The artist invents new “ways” to tackle questions of truth. The truth, however, does not appear as such; rather, it remains an enigma. often form is merely scenery inviting us –tenderly, with humor, and a little provocatively – to accept the other. In its cheekiness, the image demands the attention of the spectator, which finds itself floating between probability and imagination. Hanna projects a dream, but one aimed at causing the viewer to wake up to a more explicit and more definable reality that expresses her vision of the Jerusalem she feels. through a sphere where the viewer feels in charge. It elicits a different viewpoint, one we usually avoid, another way of believing, of loving, with these alternative ways merging together in the music and universal movement of color. The moon, revolving in the depth of the sky, is surrounded by the city’s stones and monuments, as if Jerusalem included space and time. Hanna’s depiction of the city, defying spatial norms, allows, indeed encourages, it to be viewed from different perspectives. Its people, like puppets, are positioned within its décor. Are they animated by the city, or are they the city’s music, its soul? Jerusalem, the gateway to Heaven, above time. her art but rather the peculiar medium in which all her depictions "take place". Fluk painting takes you, you might be thinking that it's Jerusalem - only. you as an extremely highly organized expression. Traditionally artists are men that of the road who will show their world- and self-exploring trip's phases as the product of their art. In women's poetry however the experience that the linear minded men might call "the omega" (and which in fact is the origo) is there from the very first moment. Women don't so much make trips, they are not so much concerned about themselves (Narcissos couldn't be a woman), they just give out signs of life which will make world a better place. While "get to know yourself" (nosce te ipsum) is a trip of a lifetime for men - women just get to know themselves in a single moment. In Hanna Fluk's case the already-arrivedness of woman artists is really obvious since her art metaphorically starts where here searching the way ended: in Jerusalem. Her art is no self-exploration, no searching for ways but rather a searching for ways of expression by which she can address the people from where she stands. Apparently she's not going for the beauty, it's not an aesthetic sensation that she's intent on giving the viewers, but rather a spiritual experience that an aesthetic sensation and an intellectual thought can together bring on. Beauty is just the first level, the second is the thought, philosophy, messages addressing men and cultures. These levels separately could remain instinctive and artificial, but in Fluck's art they unite on a third level as a sort of a refined and deep emotional philosophy. Her emblematic characters (hieroglyphs in the Keith Haring sense), the three Jerusalem based religions' male priests (or just deeply religious males) and the pregnant or rather blessed woman are like H2O molecules in water or O2 in oxygen - basic particles, everything is made out of these. It is important however to point out that this systematic motif-handling is no way to be mistaken for any kind of a restraint in artistic freedom - it is only as much of that as the fact that Bach's whole work is based on just twelve tunes :) Concept, message and the motifs don't serve as a frame for her pictures, they are in there as part of the substance impregnating the whole - freely and playfully like salty water drops in the ocean. advanced religious person and the woman is being pregnant. reminds us of a very powerful on-stage expression by Madonna when performing her song Forbidden love she staged boys of Jewish and Muslim religions as twins in cosmic harmony with each other. Numbers of the barcode are country code and area code for Israel and Jerusalem (on the "yellow one" there's only the 972). The 0123456789 after that is the metaphor of "everything is possible" which in the process of attribution is supported by an endless sign. Finally (reading left-to-right) the Aleph (alpha in Greek) like magic turns the whole consumer context of the painting into a religious, transcendent depiction - since this barcode is marked by the sign of creative energy - that of God. The barcode (that is according to consumer culture usually black & white) now vibrates as a colourful background (either we think of the "yellow" or the "normal" Jerusalem Barcode), while Jerusalem as the background of the background is present as the source and origin and meeting point of all the positive, creative energies. Hanna Fluks paintings take place in Jerusalem, at the peculiar intersection of religions, cultures and layers of times. Religion, religiousness is a default motif, however her pictures are not religious ones in the traditional sense. They are not profane either, nor materialist - they are not attacking religion from a non-religious point of view at all. They are simply thoughts about man, about the world, religion, cultures, God, men and women - being artistically abstract and warmly human thoughts. Man, God, universe, man and woman - transcendence and everyday life. Her paintings are often provocative and remarkably feminist (and by feminism at the heart of Middle East we mean something special), and yet they are still very respectful - even bashful in a way. Hanna, what do you want to show me? This picture has herself and an orthodox man in a virtual scene and it's especially remarkable. It is iconic and collage-like at the very same time. Also it reflects Fluk's dealing with different dimensions, different levels for a "character" of being present. Her most frequent hieroglyphic symbols, characters, the orthodox man and the pregnant (blessed) woman now appear relatively in "3 dimensions". Within Fluk's system they now appear in their material, sort of "real life", material selves which is being emphasized by the strong consumer context of the clippings from papers. On the woman's side you see ads targeting the woman (cans, household, cleaning), on the man's side classified ads from an orthodox paper - both sides are really humorous but not only that: also very much ironic. These clippings don't criticize religion - not at all, not even orthodoxy towards which Hanna Fluk is obviously related with respect - they just expand the human motif within the religious context - up to a scale of being provocative. On the man's side ads about a prayer book that someone lent out but never got back, or another one about getting foreigners to take care of your old parents - both reflect on the religious life alongside commandments like don't steel, respect your parents, and the do it from a very human context. Beyond the the level of this rich representation of the consumer world there is however a much sharper and a much more serious message unfolding and it's about the separation of the worlds of a Jewish woman and man. The man is targeted by ads like wine and travelling, while the woman will be a target to ads about cleaners, or that of a movie which is not for fun but for education, it's about a Jewish woman who went into a "bad marriage" after which now she and her children are finally being recovered. Fluk's paintings are elegantly playful yet really sophisticated in forming messages which can even reach the temperature of a manifesto - see Jerusalem Barcode for example or the Ascension ... (the title approximately means going to heaven without death). either. But then again going grade by grade is really nothing negative, it's just the metaphor of humbleness and discipline. also being pregnant (blessed - that now translates to carrying another extra weight). The first born sun, the reproduction of the head of the family only comes after them. You'll be again implied to think what a role women fulfil in orthodox society while it's them who perpetuate the cycle of men, who keep it go round and round - they are only the last i the line if mentioned at all. Family Ascension "just" extends the picture that people normally have in their heads and puts the woman into a fair place as an organic part of the whole. These series and "versions" of her paintings are very peculiar. It's like different performances of the same play of piece of music. Once she's created the piece - like Jerusalem Barcode - she'll be reinterpret it again and again- reaching back for this theme/play/picture anytime she likes, like a composer performing her own piece she will reinterpret it freely. This systematic playfulness may come from her studies and it's really like a virtuoso jazz musician's "improvising" - playing with the them on and on. This method can be seen in her series "Renew after Botero" - from around 2002. 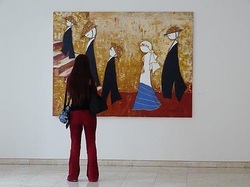 The 2009- version of Ascension is the main picture of the exhibition at the Budapest Gallery. The size of the painting is significantly bigger then its predecessors but the painter has even intensified the message of the philosophic manifesto. This time she's (herself, the woman character) walking in the line with the men which is formally less provocative then the 2003 version but its feminist charge is even more serious since she's walking with the orthodox men as an equal person (the figures are all airy their feet won't touch the ground - not visible at all). THe woman carries stones too however she's doing that not on top of her head but in her body - at her forehead, breast and belly. Between orthodoxy and reformism women and their status really make a cardinal issue, see women's ordination as rabbis which in the US owing to HUC's efforts has been a widespread practice since 1972. Hanna Fluk is a radiant, talented artist who can deliver the viewers such great knowledge and experience in a form of a single flash that you wouldn't be able to get in any other way. Only a woman can do this - in a blessed state.